Scotty Allen with his (kinda) new iPhone 6s. When Scotty Allen decided he wanted an iPhone 6s, he didn’t want to pick one at the Apple store. 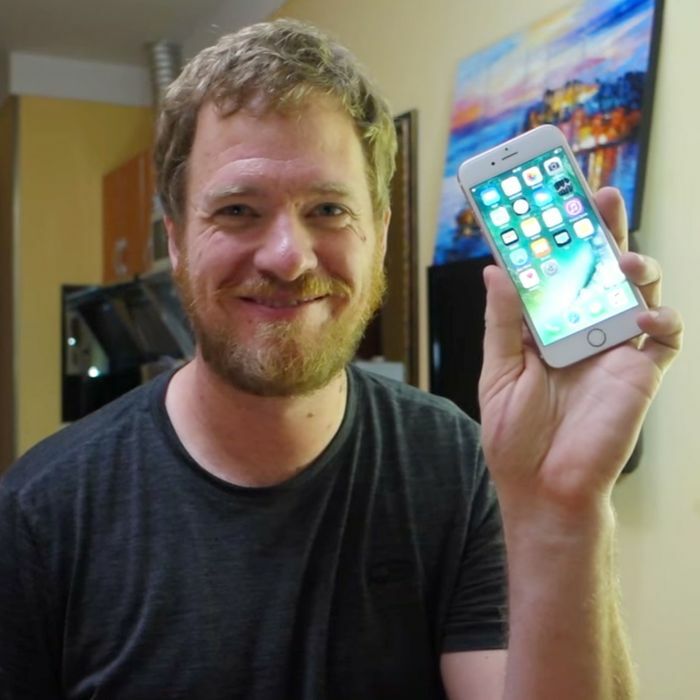 Allen’s been living in Shenzhen, China, for over a year now; and while there’s an Apple store there, Allen wanted to explore the markets of Huaqiangbei, where cell-phone parts are sold the same way you might browse old records or Princess Diana commemorative plates at a flea market in the States. The process was not easy. Even with the aid of a local, Freddy, Allen found himself trying and failing to teach himself to solder, in order to build a working logic board, as well as just explaining to bemused locals why he wanted to build a phone from scratch, when he could buy a perfectly good one a few stalls over. What was the impetus for this? What made you want to make your own iPhone? It was two motivations. It wasn’t my original idea, someone else I hang out with asked the question, “Is this possible?” I hang out with a bunch of open-hardware geeks, and a lot of us either live in Shenzhen, or pass through Shenzhen to check out the factories and the manufacturing scene. And a lot of us have walked through the cell-phone markets. They’re between where a lot of us stay and the main components markets, where people go to buy for more general-purpose prototypes. It’s almost unavoidable to walk through these markets. The second motivation was, when we walked through these markets, in isolated instances, you can understand what a booth is selling, but you can’t always understand why at first glance. Like, why is this person taking apart twenty-year-old cell phones? Where did they get them? Where are they going? And who would possibly want them? This seemed like a really good crack in the facade to give me an excuse to really dive deep — to really understand: How does this ecosystem work? How do these booths fit together? What is all of this stuff now? — and map out everything that’s going on. When you put this phone together, what was the biggest insight you had in how the global market works for consumer electronics? That’s a good question. I think in terms of the global market — I think one of the interesting things is that a lot of the parts that they use, I’m pretty sure are from used phones that came to China from the U.S. Each logic board has some model numbers on it that aren’t on the exterior of the phone — you can get to them in the settings on the About page, and there are some letters in there that indicate what country the logic board was intended for. If you look at that for the logic boards I have, it’s a U.S. logic board. What I think is, it was a legitimate iPhone at one point; it was shipped to the U.S., sold to someone, and then they recycled it, or returned it on a carrier warranty — they broke a screen or whatever. And it somehow made its way back to China and got taken apart. The ecosystem through which all of these parts flow is very international and very fluid. Stuff is passing back and forth between countries multiple times. Another takeaway would be the fact that there’s a really different attitude toward recycling and reuse, particularly around electronics, compared to the U.S. For instance, how many of us have a cell phone sitting in a drawer somewhere? Chinese people would think this is completely crazy. They don’t understand why you wouldn’t sell a phone that’s still good, because it could still be made useful. And these are not necessarily people who are incredibly poor — it’s just, they don’t understand why something would sit unused, and why you wouldn’t get the most use out of it. If it’s got a cracked screen, you can sell that to someone who will take it apart, and use it to repair other phones. There’s just a really different cultural attitude there. We’re comfortable repairing our cars; we’re comfortable taking our car to the mechanic; we’re even comfortable having a mechanic put in a part that wasn’t made by the car manufacturer. It’s not a big deal to have an aftermarket battery in your car. But as soon as you do that to someone’s cell phone [here in the U.S.], they get really nervous. I don’t think it’s a very healthy tech ecosystem, where you have a couple of really large manufacturers that have a throttle hold on all the parts and all of the access. So what actually brought you to China? What’re you doing over there? The promise of exploring these markets and this manufacturing scene. I’m a full-time nomad; I’ve been traveling for three years. I got here about a year and a half ago and totally fell in love, and spent half my time since then learning about hardware, and manufacturing, and supply chains, and the markets, and cell phones, and … yeah. I can’t get enough of it. So let’s say, tomorrow, I book a ticket to Shenzhen, and I follow your procedure to get an iPhone made, and then fly back to the U.S. Am I making a cost-effective decision there? [Laughs] No! No, of course not. Not if you include your plane ticket and the time you’d spend, both traveling out here and then the time spent making it. And this is something that hasn’t been fully accurate in other stories about this: This isn’t about trying to save money. It happens that what I spent in parts is less than what it would cost to buy a phone in the Apple Store, but I’m also taking on a whole lot of risk that a part will break, or isn’t up to spec, and I’ll have to buy a new one later. It’s not about having a phone for less. For me, it was really about the challenge. Is this possible? And what can you learn along the way? And what other doors open along the way? So what other doors have opened? This feels a lot like the desktop-computer days. When I was a kid, the first couple of computers we had were beige boxes built by a manufacturer. But at some point, people started modding their computers and doing all these crazy things. I think that was fueled by the modularity of the components in the PC, and that it felt like it was okay to open it up. I think phones are ripe for that. It really isn’t that hard to crack open a phone, or even build one from scratch. I’m a little bit perplexed about why we’re not seeing more of that desktop-modding culture come to cell phones. Modding culture brought with it a whole bunch of innovation — like, “Oh I can do anything? Let’s see how far we can take it.” And you’re not seeing that with cell phones. But in the American market, modular phones came and then crashed spectacularly. Yeah, I’m not really talking about a modular phone that’s a bunch of Lego bricks that you snap together. I’m talking modular in the same way that a desktop computer is modular — you still have to open it up, undo screws, connect cables, and remove hard drives — it’s not something that my mom is going to do. I don’t know if we’re going to see an iPhone design where there’s a whole bunch of modular pieces that you swap up. But, for me, it’s just this idea that the thing isn’t a magic box. You can crack it open. You can replace the screen. You can replace the battery. It isn’t indivisible — which is really how I thought about my iPhone before this. I sort of thought about it like, Oh, it’s this black box that runs iOS, and I should never open it, or I’ll let the magic out, and it’s only to be opened by Apple technicians. But now, I just see two screws, a bunch of glue, and a bunch more screws holding a logic board in. There’s nothing magical about it.